This homemade honeycomb soap recipe is so easy to make and is formulated with natural bee pollen praised for it’s natural skin soothing properties. Used in topical products, bee pollen is shown to calm inflammatory conditions and common skin irritations like psoriasis or eczema. In addition the amino acids and vitamins naturally found in bee pollen help to protect the skin and aid in cell regeneration. I scented mine with a sandalwood patchouli fragrance oil, however you can scent them with a honey fragrance oil or nothing at all to suit your tastes or skin care needs. 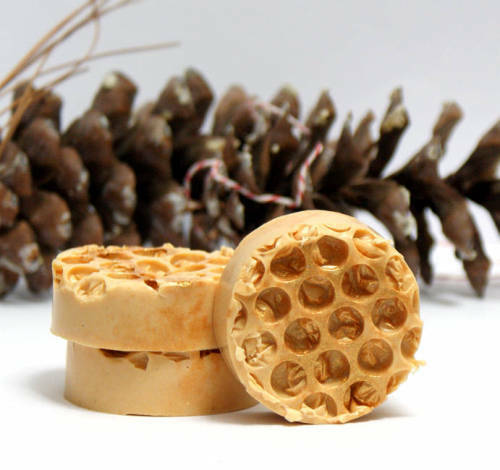 I created these homemade honeycomb soaps using a round guest sized soap mold so you can make a lot of these without a lot of raw materials. This makes them perfectly suited as homemade stocking stuffer gifts or even DIY wedding favors. 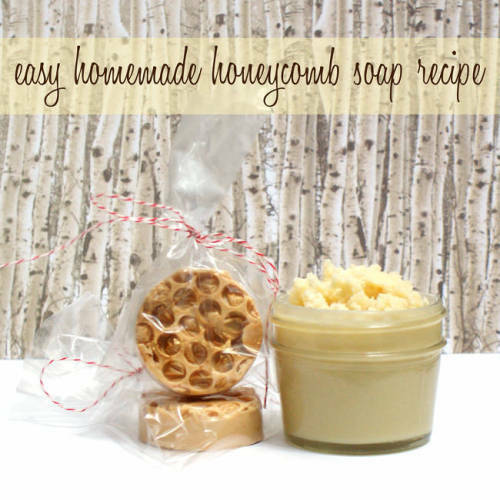 This homemade honeycomb soap recipe yields three guest soaps. Increase the recipe as needed for additional soaps. The mold has six cavities so this recipe is easily doubled to fill the entire mold. Begin by using a pair of scissors to cut the bubble wrap into circles to fit into three of the mold cavities. Place one piece of bubble wrap into a mold cavity with the “bubble” side up. Using your digital scale weigh out the melt and pour soap base. Cut into chunks and place into a glass Pyrex measuring cup. Heat in short bursts until the soap is completely melted. Melting times will vary depending on the base you use. Now weigh out the fragrance oil or essential oil you’re using (if any) and stir into the soap. Before pouring the soap into the mold sprinkle a bit of gold mica onto the top of the bubble wrap. This will give the soap extra definition and sparkle. Directly follow with the soap base pouring the melted base evenly into each of the three mold cavities you have prepared. Allow the soap to cool and harden completely. You can speed this up a bit by placing the mold in the refrigerator however abstain from placing the mold in the freezer as it can damage it. Once the soaps have fully set gently unmold then wrap as desired. 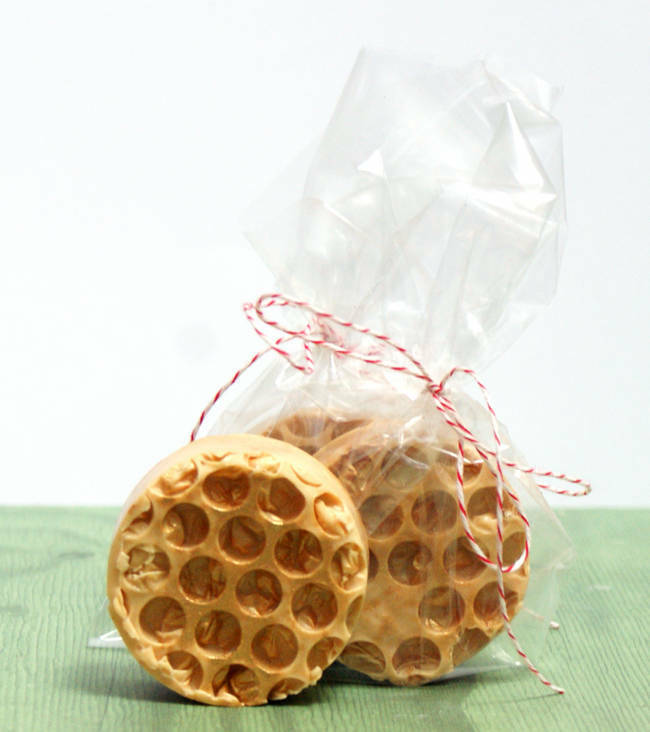 I place each of my soaps into Make ‘n Mold Clear 6″ x 3.75″ Treat Bags then tied each one with baker’s twine . For a larger homemade gift idea pair your homemade honeycomb soaps with my delectable vanilla fig scented non-greasy body butter. You can find the recipe for my non-greasy body butter here. You may also like my stocking stuffer sized festive holiday homemade cranberry orange soap recipe. For more homemade bath and body recipes be sure to visit Rebecca’s Soap Delicatessen. You can also find more skin care recipes and homemade Christmas gift ideas by following my Pinterest boards. If you’d like to read more from Soap Deli News be sure to follow me on Tumblr, Blog Lovin’, Facebook, Twitter and Instagram.